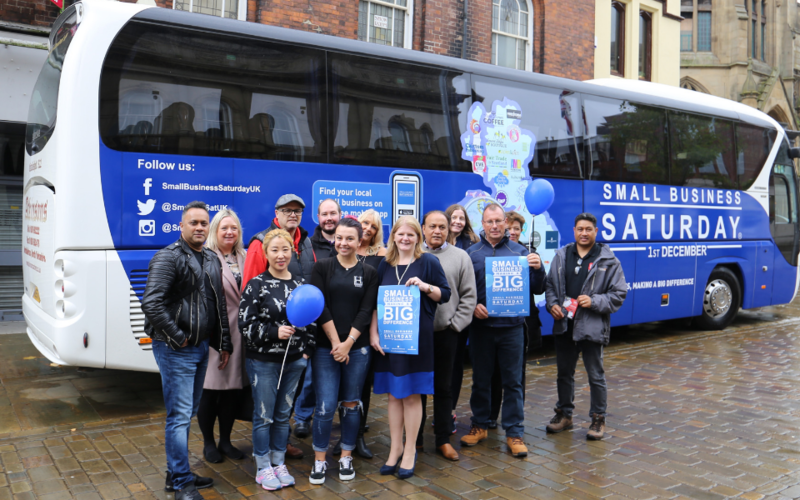 The striking blue and white bus made its first stop outside of the Town Hall with delegates from Blackburn with Darwen Borough Council showing their support for the campaign and local traders. The annual event encourages shoppers to support small businesses on the first Saturday of each December. This year it’ll fall on December 1 and residents are being asked to support local shops, family businesses, wholesalers, businesses services and manufacturers by visiting them or their online stores. We are lucky in Blackburn with Darwen to have a really good selection of small businesses both online and in our town centres. Small Business Saturday is a great campaign to encourage us all to support independent businesses – especially when we’re in the midst of doing our Christmas shopping. Events like this provide a really welcome boost for the small businesses and also remind us of those hidden gems in our borough. I’d encourage everyone to back this campaign and shop local – not just on Small Business Saturday, but all year round. The bus tour is set to call at 30 different towns and cities in the run up to December 1. On the day, many small businesses run special offers and discounts.